Churches yesterday endorsed the new dispensation led by President Mnangagwa, saying Zimbabwe is not a militarised State, as key institutions are not manned by serving military personnel. 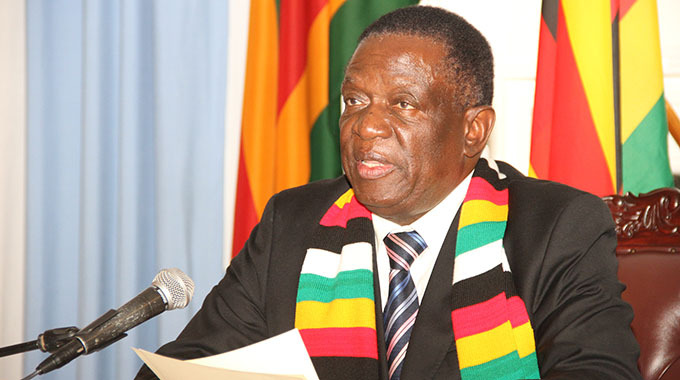 The religious leaders pledged to rally behind President Mnangagwa in the forthcoming harmonised elections, saying he was capable of transforming Zimbabwe into a prosperous nation. Churches made the endorsement during an interactive meeting with the President in Harare yesterday which they also used to air their grievances. One of the challenges the church leaders highlighted was that some of their land was taken away by powerful figures during the previous Government led by former President Robert Mugabe. Speaking on behalf of the churches, National Elders Forum chairperson Bishop Felix Mukonowengwe implored President Mnangagwa to restore the lost land to the churches. “The church has been a development partner of the State in the building of schools, hospitals and businesses,” he said. “We believe that considering offering land to the church will have far reaching developments. The indaba, organised by the National Elders Forum, was attended by heads of the Catholic Church, Evangelical/Pentecostal churches, Apostolic and other main line churches, which included United Methodist Church (UMC), Reformed Church in Zimbabwe (RCZ), Methodist Church in Zimbabwe and the Zimbabwe Christian Church (ZCC). ZCC leader Bishop Nehemiah Mutendi said the transition in Zimbabwe was peaceful. “We should now tell our people the person who is ready, who is mature (to rule), who suffered with his people for a long time to the extent that he almost lost his life,” he said. He added: “We have been applauded wherever we go over the peaceful transition and many ask how we did it. “Do not be afraid, President, we are with you. Some people say we are being ruled by soldiers, which is false. We are being led by mature people who came from the war. Those who are still in the army are not here. What is left is for us to go and tell our people on the direction to follow,” Bishop Mutendi said. Bishop Mukonowengwe said they were fully behind the new dispensation. “The politics of our nation had at some stage reached an intractable level where politicians were superintending over a fast deteriorating situation and economic meltdown,” he said. “We observe that people had borne the brunt of harsh economic and social conditions with no recourse insight, hence we welcome the advent of the new dispensation that has brought relief to an oppressed people who now have an opportunity to expect a better future. Representing evangelicals, Overseer Never Muparutsa said they needed more land to build schools and churches. Council of Apostolic Churches representative Bishop Clement Chisango said they wanted to participate in the formulation of laws. Speaking for the Zimbabwe Council of Pentecostal Churches, Dr Farai Katsande, said the new political administration should give an ear to churches. “People engagement has not been taken seriously, a good example is on the change of the education curriculum,” he said. “We engaged the parliamentary portfolio committee on education expressing our concerns. Apostolic Council of Churches leader Bishop Johannes Ndanga said some churches were given land for free and the same should be extended to indigenous churches. Chairperson of the National Peace and Reconciliation Commission Justice Selo Nare, who also attended the event, said the Commission will work with churches to reconcile Zimbabweans. President Mnangagwa promised to look into the grievances raised by the church leaders. These included restoration of a National Day of Prayer, having a Minister of Religion and the restoration of the land that churches lost to powerful figures during the previous administration. “We in Government would want to reciprocate to these relations,” he said.